I've been working on Elizabeth all weekend. I was going to set her aside today to work on Shores, but it didn't happen. I guess I'm enjoying it too much to put it down! 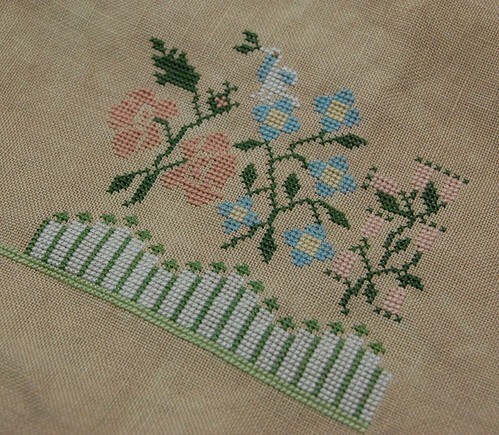 40 ct. Vintage Meadow Rue by Lakeside Linens, NPI silks (1 over 2). This is going to be a huge sampler! Check out Ellen's latest wip pic. It's just amazing!! Well, the kids go back to school tomorrow. Time to get back to our routine. No more sleeping in - I'll really miss that! :) Write soon! I love the colors in this one, Nicole - I can't wait to see your progress on this! Gorgeous, Nicole! Don't blame you for not wanting to put it down! Oh, jeez, Nicole, now I am so sorry I did not kit it up! It's far prettier than the package would indicate. Oh so pretty!!! I'm looking forward to seeing more! My daughter has gone back to college and my son goes back to hs tomorrow. Yup - back to routine. Ah well. 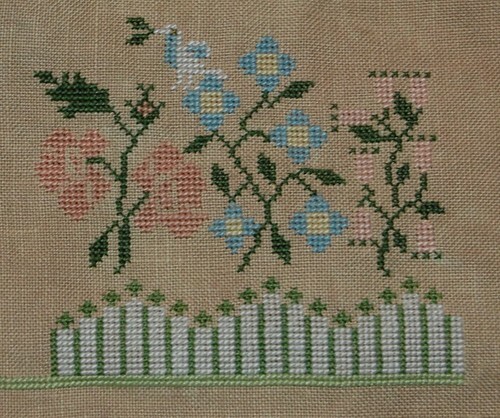 Beautiful piece, I love the linen you chose. Great new start! Ugh....hate the thought of going back to work!!!! Such soft colors!! I'd have a hard time putting it down too! Lovely colors - maybe you're in the mood for spring! Back to work today, too. Yuck - how did two weeks pass so quickly? You're off to a wonderful start!!! I think I'm going to have to add this to the stash pile. Is that border at the top bargello??? Oh, be still my heart if it is. That house in the center looks daunting though. I'm going to be looking forward to your progress on this! That's such a pretty piece Nicole, beautiful colours! You've got a lot done already, great progress. Good Morning, wondering if you are using the silk threads...happy stitching...love visiting your blog! Have a great day! Opps...you've already listed the products used. Sorry. Oh my Nicole....I love the photos. I started at the top and can hardly wait to get down to the bottom to stitch what you have done. Hmm--just need to get through that enormous building first. Please keep posting lots of photos.